Now is a great time to be a hunting dog. At no other time in modern history has the quality of training equipment, health maintenance, and canine hunting gear been at such a high level of sophistication, efficiency, and effectiveness. Because of modern technology, teaching a dog basic obedience and more complex lessons in behavior is simpler, easier, and quicker as well as more predictable and more reliable. Likewise, scientific advancements in canine medicine along with research and development in nutrition have made life for all dogs better, longer, and more productive. And, new kinds of hunting gear for all dogs have made every dog's life much more comfortable, much safer, and much more rewarding. E-collars have come a long way. Using them has been a boon to amateur handlers and their sporting dogs. Anyone with a dog that hunts waterfowl knows that to get and to keep a duck and goose retriever in good working order takes lots of training from the beginning to the end of a dog's career as a hunter. Important in the training process is to use the best of the old and new training methods and training tools. Most all waterfowl hunting dogs, whether young and new or old and experienced, need a consistent and fully-functional training program made easier now days by dozens of training books and videos. In this magazine are advertised more than two dozen manuals and DVDs that cover all of every dog's training needs from puppyhood through adulthood. Subjects included are: teaching a young dog all facets of basic obedience and introducing a pup to retrieving dummies, live birds, gun fire, boats, blinds, decoys, and water. For more advanced dogs, there are instructional books and videos on marking drills, blind retrieves, force fetching, and e-collars, as well as preparing any retriever for hunt tests and field trials — everything a dog needs to know to be a good competitor and a complete hunter. The do-it-yourself dog owner/trainer can use these books and videos to develop a personal training program. If the dog owner, however, doesn't have the skill, self-confidence or time to do all that is necessary to produce a well started or completely finished retriever, there are many professional trainers advertising in Wildfowl Magazine or in Gun Dog Magazine, as well as on the websites of these publications. Most all of these professionals will train a dog and the dog's owner, a good combination when available. 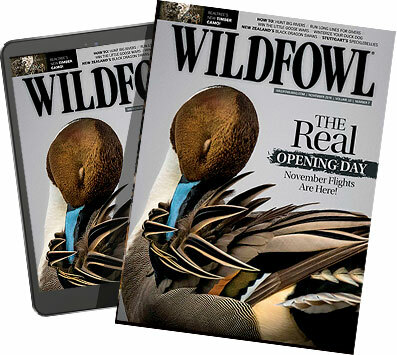 For those waterfowlers without a dog, there are dozens of breeders advertised in these magazines with all the most popular as well as the more exotic retrievers available. Likewise, in Gun Dog Magazine, there are found many breeds of versatile gun dogs that can serve well as duck and goose getters on land and in water. The development of modern e-collars is already one of the major advancements in teaching and shaping the behavior of any modern day gun dog. Because of major improvements in this remote training tool, all hunting dogs can more humanely and more effectively be taught lessons in basic obedience (come, stay, sit, heel, kennel, and quiet). Likewise, they can more efficiently be controlled when giving in to impulsive instincts (fighting wild animals such as skunks, raccoons, or porcupines, or chasing big game animals like deer, moose, or antelope). By following the directions that come with these training tools and by exercising common sense, most any dog owner can use an e-collar to reinforce all commands any dog learns through conventional teaching methods and with standard training tools such as a check cord. In fact, many dog owners and professional trainers see the e-collars as a mile long check cord that reaches out to remind any dog of what it already knows. Training tools for dogs that hunt waterfowl have made some major changes particularly in new kinds of retriever dummies and dummy launchers. Though the standard tube-shaped retriever dummy, made from rubber or canvas is still popular, new types of retrieving devices are now available in a variety of shapes, colors, sizes, and functions. There are retrieving dummies in the form of game birds with the look, weight, feel, and even the odor of real waterfowl ranging from little teal to giant Canada honkers. Some dummies have fabric streamers on them to replicate the sight and sound of ducks or geese falling from the sky. Dummy launchers include the type powered by a 22 caliber shell that can project a dummy over 100 yards with a "bang" sure to get attention and to develop the enthusiasm of any retriever. Spring-loaded, box-style, manually or remotely activated launchers are available to throw dummies, dead game birds, or live game birds for great distances as a way for a single dog owner to train without an assistant. Compared to dog food 25 years ago, today's products are light years ahead of what they used to be mainly because the dog food makers know so much more about animal nutrition. Dog food or dry kibbles, the main form of food for a majority of waterfowl hunting dogs, is a balanced and complete source of nutrition that can keep any dog healthy and from puppy-hood through adulthood and into old age. Look on the list of ingredients on any bag of dog food from the major manufacturers and you will see dozens of key nutrients, all designed to give needed energy and necessary additives for a good daily life and healthy long life. Protein from real meat (chicken, beef, lamb), fat in high quality and in balanced quantity, carbohydrates (from grain and other sources) along with a variety of vitamins, minerals, and other health products (glucosamine and chrondrotin, probiotics, omega-3 fatty acids, and antioxidants) — all come together to make an ideal food source calibrated by scientific research and development. Because of all this, our dogs may eat and might thrive better than their owner does. Canine medicine, likewise, has come a long way in the past 25 years with many major dog disorders and diseases now under control. Medications are now extremely effective for internal parasites including hook, tape, round, and heart worms and external parasites such as fleas and ticks that carry a variety of diseases. Likewise, distemper, hepatitis, leptospirosis, rabies, and other once commonly devastating health issues have been nearly irradicated by modern vaccines. can be treated with modern drugs and veterinary care. Veterinary science has likewise made some major improvements in the past 25 years with the development of more scientific knowledge about animal care in general and canine care in particular. Doctors of veterinary medicine know more about genetic flaws in dogs and how to treat and to avoid them in breeding programs. Hip dysplasia, for example, in all breeds of dogs is better understood and capable of being reduced as a problem if breeders will test for the disease and develop a responsible breeding program to avoid it. "Crates, Trailers, and Slide-In, Truck-Mounted, or SUV Mounted Boxes" In the past several decades, the means for confining and transporting while traveling down the road have greatly changed for the better. Portable, lightweight, and durable dog crates have been improved with new designs, materials, and construction to create products that are more functional and affordable. Likewise, dog trailers and truck-mounted boxes now days come in an increasing number of models that can hold a few dogs or as many as two dozen sometimes in heated or air conditioned comfort. And a multitude of boxes can be installed on ATVs to give yet another way for dogs to travel on the road or in the field. With these products comes more comfort and greater safety when dogs travel and with these advantages most dogs can be more productive during training sessions, in competitive events, and on hunting trips. Hunting gear for gun dogs has been in a state of constant progress in the past 25 years with all sorts of new products to help all breeds of canines to work harder, more safely, and more productively. For example, neoprene vests in a variety of designs have made any dog's life more comfortable and with less danger in cold weather and freezing water. Likewise, dog blinds in the field, dog stands in water, and dog ladders in boats have made hunting in harsh conditions less stressful. At home the lives of our canines are also better because of new types of outside runs with kennel fencing that is stronger and made to last longer. Dog houses, likewise, have been changed with new designs and materials to make a dog's time outdoors much healthier. And, in the house, the lucky house dog now has a variety of commercially made beds for lounging and sleeping. Other updated accessories for hunting dogs can be seen in any dog supply catalogue or website that show wide choices of leads, leashes, whistles, gear bags, water and food dishes, identification collars, anti-barking collars, blank pistols for training, tick and flea repellant, shampoos, training bird carriers, pigeon and game bird pens, cedar ribbon dog bedding, and canine first aid kits. This is a good time for dogs that hunt waterfowl. With all the progress in training programs and equipment, all the improvements in canine nutrition and health care, and all the good gear that has been devised for dogs, every new hunting season should just be getting better for all hunting dogs and their owners.